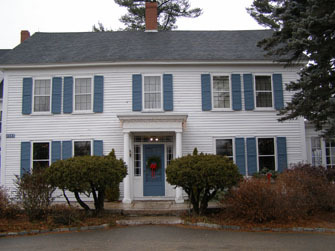 It was a cold, almost winter night, and we had a delicious dinner at the 1785 Inn and Restaurant in North Conway, New Hampshire owned by Charlie and Becky Mallar for the past 29 years. We sat in the main dining room where an inviting fire blazed in the large fireplace, and basked in the warmth and admired the holiday décor. 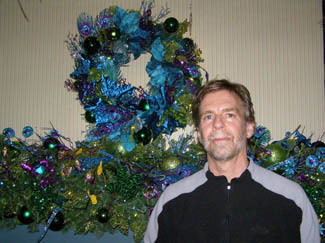 Becky Mallar had transformed the room for the holiday season gorgeously decorating the mantel and the mirror, trimming each of the windows with garland, ornaments, and attractive wreaths, and the large picture window was the perfect setting for a tiny holiday village. 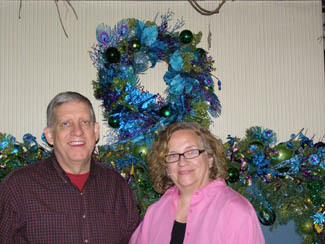 For the holidays, Becky Mallar, an inspired decorator lets her creativity flow throughout the 1785 Inn and Restaurant. 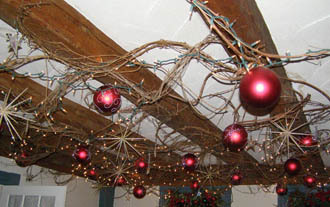 Her unique December 2012 vision began in the entry where a plethora of colorful ornaments hung from the ceiling, and continued in a dining room with a dramatic crimson theme. Another room featured blue and white décor, and she had created a fantasy room using teal and turquoise and incorporating peacock feathers in the ornate mantel décor and complementing mirror. 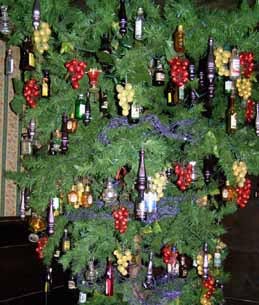 She had also used unfurled grapevine wreaths, which she had stapled to the wood ceiling beams where she hung imaginative teal and turquoise ornaments, and hung empty miniature bottles of alcohol and grape ornaments on the tree in the bar. Chef Peter Willis is the creative talent in the kitchen where he has worked for the past 19 years, and his menu is diversified enough to intrigue food adventurers, yet has enough mainstay items to appeal to a wider palate as well. A few of the more exotic items on the menu include Venison Carpaccio served with Miti Blue Cheese and Aged Balsamic Reduction; Elk Sausage served with Shiitake Mushrooms, Herbs, and Grafton Village Cheddar Cheese; or Rabbit, Prepared Two Ways: Apple Wood Smoked Rabbit Loin and Rabbit Leg Confit, served with Wild Rice and Apple Custard with Currant and Port Glaze. Traditional items on the menu with intriguing twists include Black Angus New York Sirloin Strip served with Truffle, Smoked Onion and Rosemary Aioli, Green Peppercorn, and Blue Cheese Demi Glace; Half Rack of New Zealand Lamb Marinated in Red Wine Garlic and Herbs served with Rosemary Goat Cheese; and Sautéed Chicken Breast with Cinnamon, Pecans and Cherries, fired in an Orange, Cumin Glaze. 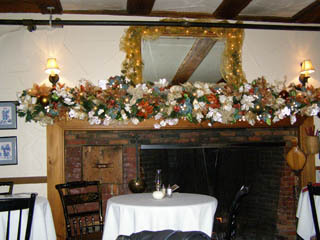 We sat a table in the main dining room with its wood beamed ceiling, part of the original 1785 building, as is the living room, where a fire roared in the large fireplace once used as the cooking fireplace. Duncan Phyfe chairs flanked tables dressed with white linens, red napkins, and small hurricane lamps that created a soft ambience as did the glow from the fire. The restaurant offers a nice selection of wines by the bottle, by the glass, as well as a selection of flights, trios of 2-ounce glasses to pair with courses or as a way to sample a variety of wines. We decided to sample their Mystery Wine Flights, which our server Alan brought to our table and handed us each a card listing the information for the other's wines, so that we could test our palate and our wine knowledge. For Edward, his red wine flight included Erath Pinot Noir from Oregon, Jacob's Creek Shiraz from Australia, and Estancia Cabernet from California. My white flight included Ruffino Pinot Grigio from Italy, Columbia Crest Riesling from Washington, and Coppola Chardonnay from California. In addition to being the Innkeeper and decorator, Becky is also the baker, and Alan brought us a basket of her delicious rolls served hot from the oven to enjoy while we waited for our appetizers. 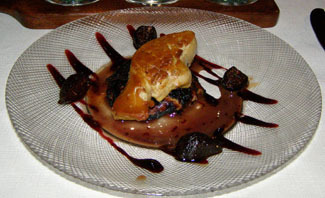 For Edward, there was an appetizer of Seared Duck Foie Gras with Grilled Quail Breast, Port and Figs, artistically presented, and a sensory delight to the eyes and the palate with its complementary flavors and textures. 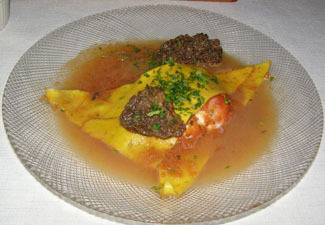 I had the Braised Morel Mushroom, Open Ravioli with Smoked Tomato and Sage Jam and Buffalo Mozzarella, presented as triangles of tender pasta crisscrossed over the mozzarella, with the earthy morel mushrooms anchoring the plate, and served in a rich, tomato broth. Next came a palate cleanser, a delectable sorbet made with blackberries, fennel, and cumin served in a martini glass with a flavored sugar rim. 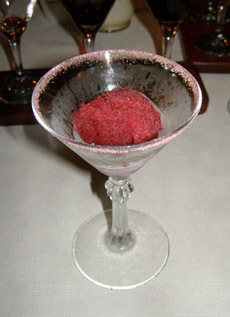 We loved the savory, sweet elements of the sorbet, as well as the interesting combination of flavors. 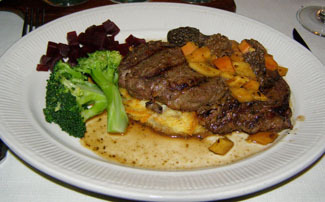 For his main course, Edward selected the Buffalo Rib Eye from Yankee Farmers Market in Warner, New Hampshire, Peppercorn Seared Delmonico Steak, Roast Sweet Potato, Turnip, and Morel Mushroom Demi Glace, accompanied with diced beets and steamed broccoli, which was a tasty dish that was well presented and thoroughly satisfying. 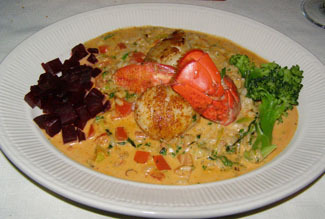 Whenever I am in New England, I cannot resist the exceptional seafood, and I had the Maine Lobster and Sea Scallops with Garlic, Tomato, and Basil served on a Lobster Cream and Parmesan Risotto, accompanied by diced beets, and steamed broccoli, which was stunning, and flavorful. Chef Peter Willis had perfectly seared the scallops to create a golden crust yet retaining the tender inside, the lobster was wonderful, and the risotto had rich flavors to intrigue the palate. The restaurant is famous for its Bananas or Cherries Foster, and we enjoyed the show as the waiters created these tempting desserts tableside for many of the diners, as well as the spectacular after-dinner flambéed coffee presentations. In addition to the Bananas or Cherries Foster, they offer a diversified selection of desserts including crème brûlée, charlottes, pies, profiteroles, and more. 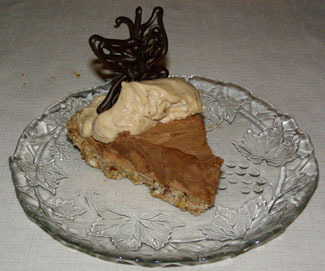 Although all of the desserts looked delicious, we opted to share the decadent frozen coffee buttercrunch pie garnished with a chocolate butterfly, which was a perfect ending to a delightful meal. Read the Chefs' Recipes section for the interview with the Chef, and for a sampling of his recipes and a delicious taste of the restaurant.